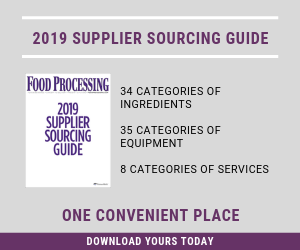 USDA's Agricultural Marketing Service (AMS) on April 4 made a customary renewal of ingredients allowed in organic processing with one wrinkle: It overrode an advisory board recommendation to remove carrageenan from the approved list. The National Organic Standards Board (NOSB), an agency advisory committee, earlier recommended renewing of 16 of the 17 substances scheduled for "sunset" review on the National List of Allowed and Prohibited Substances. The board suggested carrageenan be removed. "Based on public comments received during the review process, USDA is renewing it because there is sufficient evidence that the substance continues to be necessary for handling agricultural products," the agency announced. "Carrageenan has specific uses in an array of agricultural products, and public comments reported that potential substitutes do not adequately replicate the functions of carrageenan across the broad scope of use," the agency announced. "Therefore, carrageenan continues to meet the OFPA [Organic Foods Production Act of 1990] criteria for inclusion on the National List. The renewal of these 17 substances will avoid potential disruptions to the organic industry and the public that may otherwise result from their removal from the National List." One scientific study from about 2008 made a connection between carrageenan, a colloid sourced from seaweed, and poligeenan, which is a suspected carcinogen. Studies have since refuted the link. The 17 substances were required to be reviewed based on sunset regulation. The new sunset date for these ingredients is May 29, 2023. These substances are used in organic crop and livestock production and organic handling/processing.